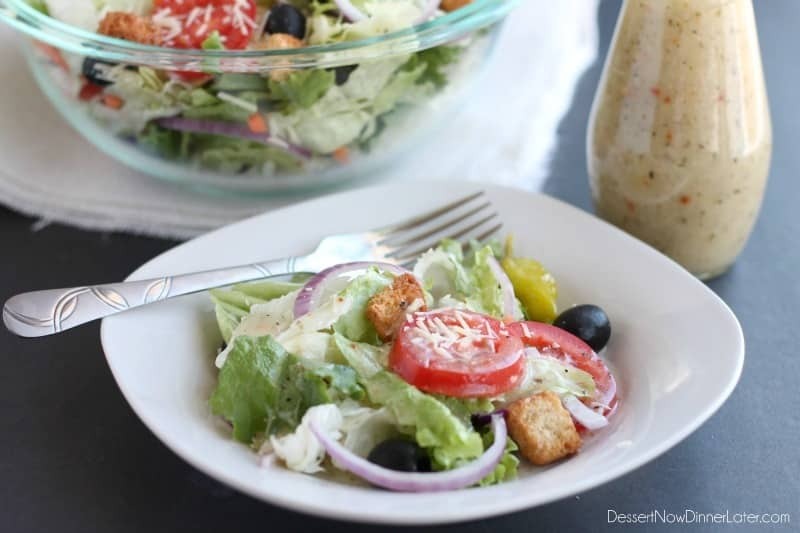 Copycat Olive Garden Salad Dressing (+ Video) - Dessert Now, Dinner Later! 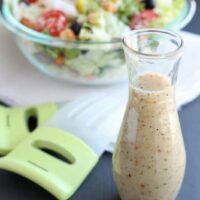 This Copycat Olive Garden Salad Dressing is as close as it gets to the real deal, without the high fructose corn syrup! Two years ago I did some copycat Olive Garden recipes for you to make for Valentine’s Day. I did a variation of Olive Garden’s Steak Gorgonzola Alfredo and Black Tie Mousse Cake for dessert. Olive Garden is definitely one of my favorite restaurants to eat at. Don’t believe me? 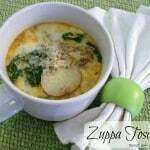 I have copycat Zuppa Toscana, Chicken & Gnocchi Soup, and the famous Olive Garden Breadsticks recipes too! I definitely used to go to Olive Garden a lot more before I got married and had kids, but honestly, I don’t need to go back. My homemade versions are just as good and a lot cheaper to make myself. This recipe is top notch! Now, I know you can buy the Olive Garden Salad Dressing at pretty much any grocery store, but this is as close as you can get to the real deal, without the high fructose corn syrup. (Check the label!) My husband is obsessed with this dressing and won’t stop asking me to make more. He can down the whole bottle himself, it’s ridiculous! Haha. 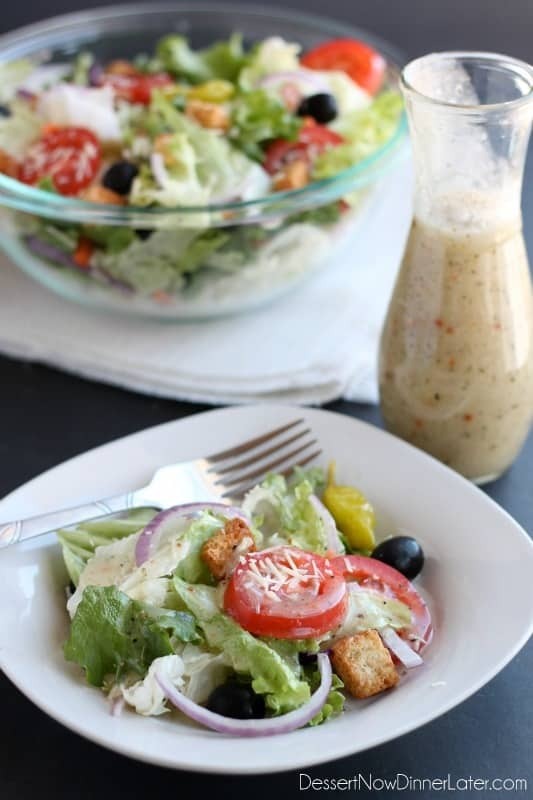 Next time you have salad, you need to try this dressing! You won’t regret it! It might even become an obsession for you like it has for my husband! I LOVE their dressing and have tried a few recipes that claim to be a copycat but they don’t really meet the expectation. I’m so excited to try this one! It looks great! Is that just regular white distilled vinegar in the recipe? This one is really, really close. My husband is the Olive Garden salad connoisseur, and he said it’s exactly like the same thing. I don’t get there salad very often, but I do think it tastes just like it too. And yes, regulate white distilled vinegar. Let me know what you think! We live in Costa Rica… There’s no Olive Garden anywhere nearby! Just made this recipe and it’s really close. Now, if could just get the bread sticks right! That’s great Steve! 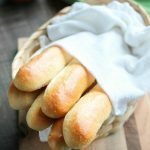 I’m hoping to work on a copycat recipe of the breadsticks soon! Stay tuned! Have you had a chance to come up with a recipe for the breadsticks? Not yet! Sorry! I will make a note of that now and will email you once I get it on the blog. Thanks Lisa! I have a copycat recipe of that too! I’m making it again this week actually! Definitely a favorite! Mmm, this looks and sounds so good! 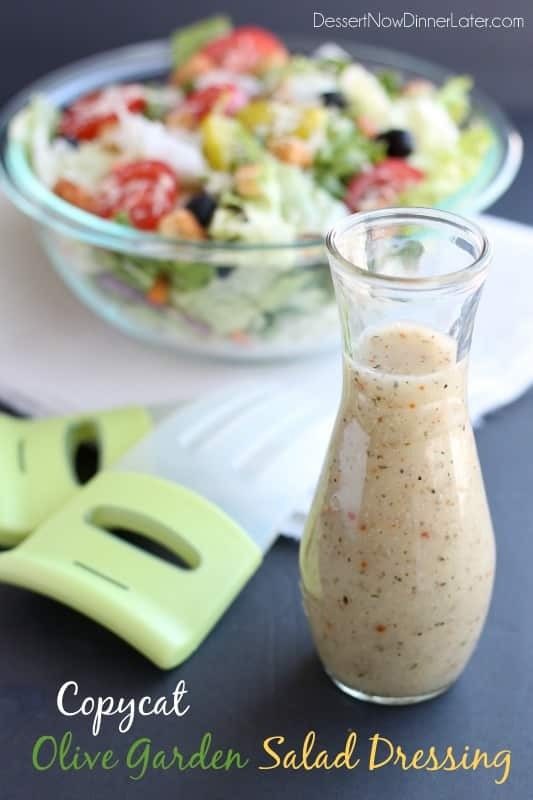 I love olive garden salad dressing, and can’t wait to try this and make it at home! Can’t wait to try this, Amber! I’m not sure I can find the Italian dressing mix here in Canada. Could you give me some hints as to what’s in the mix so I can try to approximate the ingredients? No Olive Garden restaurants around either, so I’d love to be able to make their salad! For those who can’t find these packets, there are several copycat recipes online. I live in Puerto Rico, and sometimes it’s hard to find things. But, I’m lucky that every store here has these packets. If I cannot find Good Seasonings Italian Dressing Mix up here in Canada could I use another brand or just use a bottle of dressing? I would try a different brand before I tried a bottled dressing. Try and find something with similar ingredients on the package. I don’t love salad, but for some reason the olive garden salad actually sounds good right now! I think it’s the tartness? Anyway your pictures look amazing! I love Olive Garden’s salad dressing! However, I am the only one in my family that will eat it. How long will it last in the fridge? You can store it for 4 weeks in the refrigerator. My husband loves Olive Garden’s dressing! This will be happening soon! That salad dressing sounds delicious. I really like the quality of the photos on your site. I have been working on my photography and have come a long way in the last year, so it’s great to hear these kinds of compliments. Thank you! the recipe calls for ‘italian seasoning’ but what is that? just a combination of basil oregano red pepper flakes garlic powder onion powder……..what? sounds like just up the amount of GP already in the recipe etc. does this work out if you just use the GoodSeasons packet and skip the other seasonings? Italian Seasoning is a blend of Italian spices (thyme, oregano, basil, etc). You can find it in the spice section of any grocery store. The extra seasonings really make this dressing what it is, so I wouldn’t leave them out. I totally want to make this. Thank you! My husband will eat salad now. He loves this dressing. Mine is never as pretty as yours. I wonder if its the olive oil? I actually use vegetable oil or canola oil. That might be why. Glad your husband eats salad now! This dressing is pretty rockin! In regards to the oil, I feel like mine is really oily. I’ve tried both vegetable and canola oil and was wondering if I substituted some of this with water instead if it would still turn out okay? Besides that, it’s seriously amazing. I love it! Make sure you mix it really well. The oil thickens up the dressing. You can try cutting back the oil to 1/2 cup and increasing the water to 1/2 cup, but I would definitely not change it to all water because the oil gives it that satisfying texture in your mouth, as well as flavor, and the oil balances out the vinegar. NICE! I need to try that! Thanks for sharing your experience! the vinegar is it white or Apple cider ? White distilled vinegar. I will fix that in the recipe now. Well I tried this and instead of white distilled (we had none and seeing that I’m only 14, I couldn’t go out and get some) I used a 1/4 red wine vinegar and 3/4 was apple cider vinegar and I think it turned out great and was VERY close to OG’s if not identical! YAY! Glad you liked it! And props to you for getting in the kitchen at your age. I loved to cook and bake at your age too, it’s a fun/great thing to learn! Love Olive Garden Salad.. can’t wait to try this ! Us too! Hope you like it! My husband LOVES the OG dressing and I’ve been trying to figure it out now for awhile, thanks for sharing this! Pinning!! This is great. We loved the flavor. Fantastic! Thanks for sharing your experience! Amber, this was fantastic! I had a serious craving for this dressing after hours and used your recipe, the best part was that it was all stuff I had laying around! Delicious! When it says 1/4 tsp pepper is it black pepper? Any replacements for distilled vinegar? I have yet to come across this. White distilled vinegar is white vinegar. Sorry for the confusion. I’ll fix it in the recipe to just say white vinegar. Is there any way to lighten up the dressing, calorie wise? You could try cutting back on the oil (to maybe 2 or 3 Tablespoons) and cut a tomato in half, grate it (with a cheese grater), and discard the skin. I can’t vouch for how it tastes or if it will work well with this recipe though. Whar are the ingrdients in the salad? I used green leaf lettuce (although Olive Garden is cheap and uses iceberg), croutons, sliced roma tomatoes, black olives, sliced red onion, a couple of pepperoncinis, and shredded parmesan cheese. You forgot artichoke hearts, at least the salad I have had, had artichoke hearts. So good!!!! <3 We have had this as a staple now in the refrigerator!!! Thank you! That’s so great! Glad you like it! I want to skip the mayo, is it necessary? The mayo gives it that creamy color and texture to the dressing, but you may leave it out for a non-creamy Italian dressing. IM SO TRYING THIS!!! THANKS AMBER!!! YOU SHOULD TRY A COPY-CAT OF THEIR BREADSTICKS!!! You’re welcome! Thanks for the recipe suggestion. I will work on that! Made this today–turned out perfectly! The other “copycat” recipes I’ve seen have an ingredient list a mile long. Thanks so much for sharing this simple one that is perfect! YAY! Thanks for coming back to share your experience! Glad you approve! PS.I love desert receipt to! All of my recipes have printable buttons for your convenience! Enjoy! I have made this a few times now so good, I recently changed the vinegar to balsamic and its amazing worth a try to switch things up. Ooh that does sound good! Thanks Daniel! I made this for the first time a few weeks ago and now I make it all the time! Even my husband who is normally a strictly Ranch dressing guy will eat it. He loves Olive Garden salad! That’s awesome! Glad your family enjoys it! Thanks for taking the time to share your review! Just made this recipe today! Cant wait to try it tonight! So easy to make too!! Wahoo! I hope you enjoyed it! I have made this recipe several times and just love it, Do you know the calorie breakdown? I just put it into my fitness pal and with light mayo (best foods) it’s 130 calories per 2 Tbsp serving. With regular mayo it’s 133 calories per 2 Tbsp serving. The oil is where a lot of the calories are unfortunately, but this dressing is so good! Do you put on salad dressing for hours before serving? Hi Lisa, I’m not sure I understand your question. You can make this ahead of time and shake it up or stir it right before serving. I would not put it on a salad until you are ready to eat it though, or the lettuce will get soggy. I hope this answers your question. Wow! This is an awesome story! So glad you can make this at home so you don’t have to drive so far! Thanks for sharing! That’s great news! So glad you all liked it so much, and the kids too! Yes, I noticed they started carrying it after I posted this recipe, but I still kind of like the homemade version. 🙂 Glad you approve of the taste! I have purchased the dressing from the restaurant itself and maybe it has to do with the processing involved, but the bottled dressing just didn’t stack up to what you get in the restaurant. I would be super shocked if what’s served in the restaurant is delivered rather than made, “in house.” I am looking forward to trying this recipe. I haven’t bought the bottled dressing, but I’ll take your word for it! I hope you feel like this recipe compares to the fresh stuff! My daughter made your OG dressing last night and I loved it! She sent me the Pin and I can’t wait to make it. Thanks so much! Now to look for your copycat soups…. 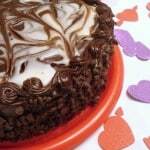 I hope you enjoy my recipes! Thanks for your comment! I just made this dressing and it is delicious! I would make it again, but it did not taste like Olive Garden dressing. I used Extra Virgin Olive Oil so maybe that is why. I will make it with vegetable or canola next time. This comment is not made to be negative at all. The dressing was restaurant quality (made it in blender) I just didn’t think it tasted like Olive Garden’s. I’m trying this tomorrow! My husband loves their food, so I’m using your recipes to prepare Valentine’s Day dinner tomorrow. I’m excited and can’t to try the results! Oh that’s so great! I hope you enjoy them all! I only had cider vinager, but it was still excellent! Great dressing. Never buying dressing from the store again! That’s great to know! Thanks for sharing your review Crista! So glad you liked it! Even though I royally screwed up this recipe, it still was a hit. I thought I saw 1/2 Tablespoon of sugar. When I realized my error, I tried to fix it by adding more oil, then vinegar, mayo, etc. If I had another packet of Good Seasonings, I could have started from scratch, but no such luck. It was pouring out and I wasn’t going back out to the supermarket. It still tasted too sweet to me, but my husband liked it. Next time, I will make sure I use the right measurements. Whoops! Glad you still enjoyed it, but hopefully you’ll absolutely love it when you make it again! You can reduce the vinegar and add a little extra water or oil instead if you like. You’re a GOD. Thank you for your recipe, it’s a staple in my kitchen!! After trying a lot of copycat recipes, I think yours is the best. Thank you for sharing it! I replace the water with a bit more mayo and vinegar. I use white wine vinegar and I think grated parmesan and lemon juice are pretty important additions to the recipe, for my tastes anyhow. (I am definitely not an expert, though!) I also like to add a bit of the juices from the peperoncini jar. That said, I would never have known where to start without this recipe. Frankly, it’s wonderful as is, but part of the fun of homemade is tailoring things to personal tastes. Thanks, again! I love the idea of adding grated parmesan, lemon juice, and pepperoncini juice. I’ll have to try it! Thanks for sharing your review! Hi Jan! Happy Birthday! Italian Seasoning (affiliate link) is found in the spice aisle. It’s a blend of Italian seasonings like: marjoram, basil, rosemary, thyme, oregano, sage, etc. I’ve linked to what it might look like depending on the brand you find at the store. 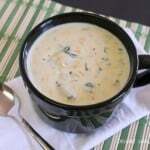 It gives it more flavor with the extra herbs, than just using the Italian dressing packet. I made this last night and it is FANTASTIC! I read through several copy cat recipes online and yours seemed to sound the best and the lightest (others called for more mayo and corn syrup, etc.) and boy am I glad I made yours! Talk about spot on and scrumptious, thanks very much for sharing! That is so great to hear Debra! Thanks for sharing your experience! Hello, Loved the recipe! Could you tell how long typically the salad dressing is good for in the refrigerator? Thanks a bunch! I would say up to 1 month/4 weeks. Glad you loved it! Thanks for your review Lucy! Nice job on the recipe, loved it! Mine needs a touch more acidity, probably my brand vinegar I used. My local Target carries the Italian Dressing mix. Hi Jay! Thanks for your review! Definitely tweak it to your personal tastes! Enjoy! Hi Jacky! So glad you enjoyed it! Thanks for your comment! I wanted to comment but my exclamation point key isn’t working. Thank you for providing a copycat version of the Good Seasoning Italian Dressing, I live in Canada and that isn’t available here. This was an excellent substitute! I’m so glad it worked out for you Erin! Thanks for your review! ABSOLUTELY AMAZING!!! MADE IT AND IT WAS AWESOME!!!! LOVE IT!!! Great news! Thanks for your review Reff! 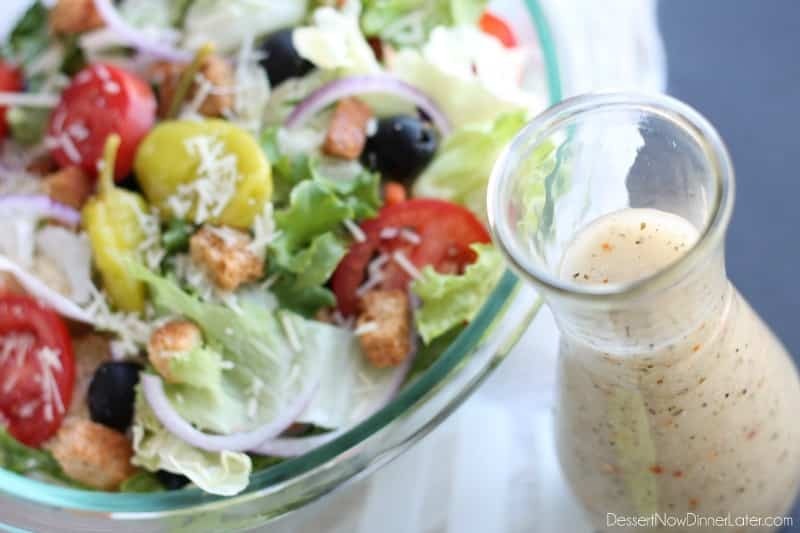 Your Copycat Olive Garden Dressing is Perfect! I love it. Those bought in the store saying they are the same, even Sam’s taste horrible!!! !Thank you so much for this recipe. I’m so glad you loved it Cheryl! I agree. It doesn’t taste as good in the store-bought version, so this recipe definitely comes in handy! Thanks for your review! I hope this helps! Thanks for your comment Karen! Delicious.. one of most famous salad. Nice recipe. I didn’t have the right oil so I used 1/2 olive oil and 1/2 corn oil. I also cut the mayo to 1/4 TBS because I really don’t like mayo. Do you think the combo of oils changes your recipe significantly? Most cooking oils have the same density, so the only difference will be the flavors of the different oils, but I think you will still be okay. You can’t really taste the mayo in this recipe though, it just adds a creamy texture, so you may want to use the full amount. Let me know how it works out! Awesome! Thanks for sharing Amy! This is GREAT!!! Thank you for sharing! It definitely helps to toss the salad with the dressing prior to serving, that way every crevice of the salad is touched. My kids devour this!! I am no longer allowed to buy bottled dressing – and why would I with this fabulous alternative!! Looking forward to your copycat breadsticks! Hi Lexi! I’m so glad to hear that you love this more than the bottle version! Thanks for following along! Copy cat or no copy cat this is one of the best dressings I’ve ever made. Love it, and today I will double the recipe. Thank you, thank you, thank you. That’s great news! Thanks for your comment Bernie! You can definitely whisk in some finely grated Parmesan/Romano cheese. It still is pretty darn close to the original without it. A great alternative without high fructose corn syrup. I believe the bottled version has high fructose corn syrup as an ingredient, so I no longer buy it. Thank you so much for the recipe! I cannot wait to try it! The store bought version does have high fructose corn syrup, which is another reason I’m glad to have this recipe! I hope you love it too! Love this dressing! I’ve made double batches of this multiple times already. All three of my kids and my husband love the dressing also. I’ve been eating salad every day with this. Thanks for the recipe! Awesome! So glad you are enjoying this recipe! I like to use True Lemon granules..not a whole pkg though. It makes everything taste very fresh. The bottled OG dressing didn’t meet my expectations either.